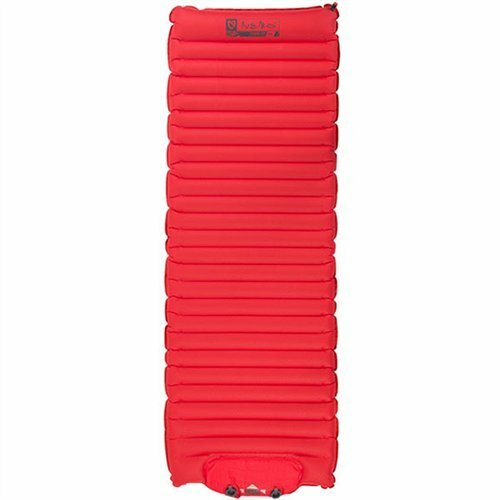 Beloved by avid backpackers and car campers alike, NEMO's Cosmo air-insulated 25L sleeping pad is the ultimate solution for better sleep in the backcountry. It boasts 3.5 inches of loft for superior spine support, a stabilizing Pillow Baffle for dreamy neck and head comfort, and 25 x 76 in. of space for even the taller men and women to stretch out on. But don't think these luxuries come at the cost of backwoods functionality: the 75D Polyester Ripstop fabric is abrasion-resistant, it's reinforced with an airtight polymer film, and the pad is equipped with a seamlessly integrated foot pump for fast and easy inflation, so you won't need to worry about rougher ground surfaces or seam splitting from firm inflation. With the featherlight weight of 1 lbs. 13 oz. and compact dimensions of 9 x 4.5 in, you can pack it over any far-off mountain pass and into the deepest stretches of woods, and once it's time to lay down, you'll be more than thrilled you did. You won't camp without it again. If you have any questions about this product by Nemo, contact us by completing and submitting the form below. If you are looking for a specif part number, please include it with your message.